Often you will get simple questions to answer. Don’t be too impulsive while answering seemingly simple questions The intention of the question setter in many cases will be to check whether you have mastered the fundamental principles. She may make a question a little bit indirect and you may tend to commit mistakes. It will be a good practice to find time to check your answers, especially in the case of multiple choice questions. Here are some simple questions on kinetic theory and thermodynamics. The equation is therefore for 1/3 mole and V stands for the volume of 1/3 mole of gas [Option (e)]. (2) Identical balls each of mass m and moving with the same velocity v hit a fixed surface normally and elastically. If there are n hits per second, what is the average force exerted (by the balls) on the surface? Since the collision is elastic, the balls will rebound with the same speed. The initial momentum of each ball is mv and the momentum after collision with the surface is –mv, the negative sign indicating the reversal of direction. 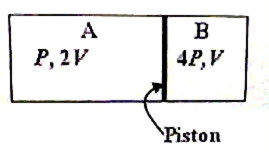 The change of momentum due to the collision is –mv – mv = – 2mv. Each collision therefore transfers a momentum 2mv to the surface. Since there are n collisions per second, the momentum transferred per second to the surface (which is the rate of change of momentum) is 2mnv. Rate of change of momentum is force according to Newton’s second law and hence the average force exerted (by the balls) on the surface is 2mnv [Option (c)]. The root mean square speed of gas molecules is directly proportional to the square root of absolute temperature. [This follows from the postulate of kinetic theory which states that the average kinetic energy of gas molecules is directly proportional to the absolute temperature]. Since the temperature remains constant, the root mean square speed is unchanged [Option (b)]. Substituting for P’ we obtain V1 = V and V2 = 2V [Option (a)]. What would be the final volumes in parts A and B if the initial pressure- volume states were (2P, 3V) and (12P, 2V) respectively? The pressure volume products are 6PV and 24PV. So the total volume of 5V is to be divided in the ratio 6:24, that is 1:4. We obtain V1 = 5V×1/5 = V and V2 = 5V×4/5 = 4V]. h = (Q1 – Q2)/Q1 = (T1– T2)/T1 where Q1 is the quantity of heat absorbed from the source at higher temperature T1 and Q2 is the quantity of heat liberated to the sink at lower temperature T2.